The most recognizable landmark in Dawson Creek, B.C., has been destroyed by a fire. 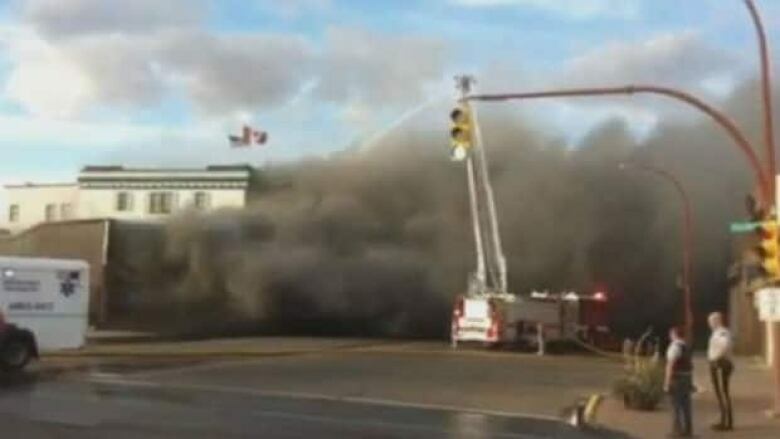 The most recognizable landmark in Dawson Creek, B.C., was destroyed by a fire on Friday. The historic Alaska Hotel was constructed when the U.S. Army came to the area to build the Alaska Highway decades before the city was officially formed in the 1950s. Mayor Mike Bernier says nearly everyone in the city packed into the downtown core to watch as the hotel burned. "When I was walking around through the crowd last night, people were quite teary, people were hugging each other," he said. "It was quite emotional for everybody involved, especially people who have been in the community for a couple of decades who could really appreciate the historical value of this building. "I think the newer people to our community were able to get a good idea of what it meant to us when they saw how upset everyone was to see that facility burn down." A neighbouring hair salon and museum were also destroyed in the fire. "[The hotel] is basically known worldwide as an iconic landmark commemorating the northern part of British Columbia and the Alaska Highway," Bernier said. "To lose that and the adjoining businesses last night to a fire downtown is just an incredible loss, very emotional for the community." Bernier says it's not clear if the owners plan to rebuild the hotel. He says police have told him the fire does not appear to be suspicious.